Assistant Vice President Sheri Van Fleet, third from the right, presents Templeton Community Library Association President Malcolm Pickett and TCLA Board Member Shirley Sigmund with a check for $5,000. From left are Atascadero Branch staff members Elizabeth May, Elisa Ingram, Carl Dudley, Vice President, and Senior Relationship Manager, and Serena Woodland. 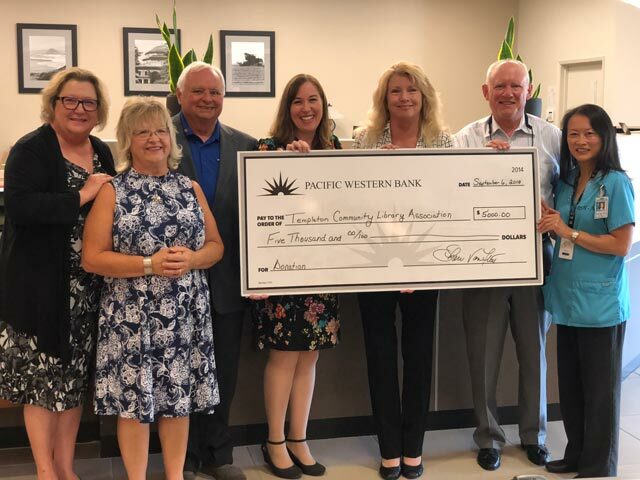 Sheri Van Fleet, Assistant Vice President and Branch Operations Manager of the Pacific Western Bank Atascadero Branch, presented a $5,000 donation to the Templeton Community Library Association. The gift is in response to the organization’s vigorous campaign to build the library at the corner of Main Street and Vineyard in Templeton. The Association has raised $1,574,00 of the $4,344,000 needed for construction, furnishings, and equipment. If the group collects $598,000 by December 31, 2018, the San Luis Obispo County Board of Supervisors will consider contributing the other 50% so construction can begin. “We are very grateful to Pacific Western Bank for their generous gift, and we’re certain that other businesses and individuals will follow suit to help us meet our goal,” he continues. Plans are underway for a Big Reveal Celebration October 14 at the site of the future library. Details will be announced soon.